Once a major shipping port and shipbuilding city, Portsmouth, New Hampshire has been given new life with artistic venues, local breweries and restaurants bringing different flavors to the plate. Much of its history still stands through preserved period homes—with some dating back before the Revolutionary War—and repurposed buildings holding clubs or eateries. Nestled near the mouth of the Piscataqua River, this seacoast location has managed to keep its past alive while creating a modern-day vibe. 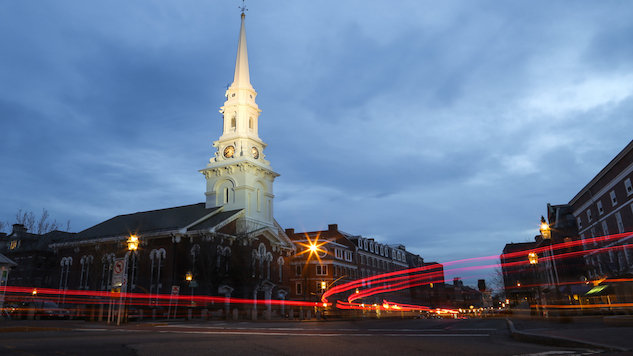 If you’re looking for a city that has history but isn’t quite dead yet, Portsmouth shouldn’t be overlooked. This downtown commercial district has been a public gathering spot since America was still under British rule. Its past uses include a military training ground and New Hampshire’s Colonial era assembly and courthouse. Nowadays around the square (pictured at top), meal options appeal to every budget and palette. The River House is best noted for its creamy and hearty seafood chowder and waterfront setting. The Franklin Oyster House, set inside a restored 19th-century oyster house, offers a $1.25 daily happy hour special on select oysters and meaty dishes including their buttermilk fried Maine Chicken. Cava serves Mediterranean-inspired tapas and small plates, extending to patatas bravas, croquetas de jamon serrano and a dark chocolate bocadillo. A chef’s tasting menu is also available. Other local options include La Maison Navarre for coffee and macaroons; Ceres Bakery for baked treats (try the gooey and delectable snitz) and breakfast and lunch specials; Breaking New Grounds for their cinnamon rolls and single origin or blended coffees; or Popovers on the Squares, a bakery/cafe with airy muffins and lunch fare. Shops cater to interests in books, home furnishings, specialty foods, jewelry and anything that can be nautically themed. Park your car at an off-street lot or in the major parking garage on Hanover Street, and enjoy the area on foot. Portsmouth breweries go beyond standard production. On Market Street, longtime downtowner Portsmouth Brewery produces traditional ales and lagers, and offbeat hybrids. On tap choices could include their American Farmhouse Ale, a light to medium bodied twist on Belgium style ale; or Nitro Nugget Pale Ale, a full bodied pale ale with an English malt profile combined with nugget hops. As for bar grub, get mussels steamed in their Blonde Ale broth, paired with two choices of seasoning and a toasted baguette for dipping in. Tucked away on High Street, Earth Eagle Brewings produces gruits, an old-fashioned herb mixture applied to bittering and flavoring beer, which was popular before hops were extensively used. Try the orange tinted Mary of the Marsh, containing marsh plants Sweet Flag, Labrador Tea and Sweet Gale. Consider ordering one of their panini-style “sammies,” such as the sweet and salty pork with cider mustard, tomato and arugula on ciabatta. In Portsmouth’s West End, Liar’s Bench Beer Company has a simple menu of sausages. Taps can dispel an Imperial Coffee Porter called Colombian Thunder Pony; the grisette-like Bench Beer; or Cali Speak, a west coast IPA with copious amounts of Simcoe and Cascade hops. On Route 1, in south Portsmouth, Beara Irish Brewing Co. imports Irish barley malt and pairs it with New England-sourced ingredients in producing beers like their NH Maple Wheat. Irish music sessions happen every weekend. Great Rhythm Brewery on Bartlett Street has on-tap and canned choices like American IPAs Sticky and Squeeze, and their American Double/Imperial Stout, Dolce. Along the edge of the Piscataqua River, this public green space was put in place by two sisters, Josie and Mary Prescott, who used a family inheritance to purchase and donate land to the city to create a park. The 10-plus acre waterfront park is lined with brick paths, formal gardens, trial gardens (where plants are grown for evaluation) and picnic areas. It’s also the location for an annual summer arts festival that features theatrical and musical performances. Named after an old English settlement, this 10-acre outdoor museum places 300-plus years of Portsmouth history—from the 1600s through the 1950s—in one setting. It consists of a mix of homes and businesses that were relocated here or are original to this location. Each sight has a backstory. One house had an immigrant family from Russia, and a mom-and-pop owned grocery store teaches about World War II food rationing. Also, look for American flags displayed at the entrance of some exhibits, whose patterns match that of the time when these properties were still in use. While the independent stores in Portsmouth offer everything from the edible to the practical, Pickwick’s Mercantile goes for the whimsical and fanciful. With store staff dressed in period attire, this boutique is an emporium of various whatnots and treats: perfumes, candies, candles, books, décor and fun accessories. The story behind this shop apparently involves a character named Mr. Samuel Pickwick, who curates his inventory based on his and his family’s travels and personal tastes. Along with its main location on State Street, Pickwick’s Mercantile has a sister store known as Lady Pickwick’s; Pickwick’s at the Banke, the Strawbery Banke Museum’s gift shop; and Deadwick’s Ethereal Emporium, a mystery shop that gets a little spooky. This memorial park along Chestnut Street, between Court and State streets, was developed in honor of Portsmouth’s African population who were laid to rest on this undeveloped land in the 1770s. As Portsmouth grew, this burying ground had been built over and forgotten about. In October 2003, a construction project led to its rediscovery, with coffins being uncovered. Spearheaded by a committee of city officials and citizens, the memorial was dedicated in May 2015, with a reburial ceremony. Its walk-through design contains sculptural pieces and historic items. A stone paving is carved with a series of phrases from a 1779 petition submitted by slaves to New Hampshire’s state legislature, requesting their freedom. The burying ground is along the Portsmouth Black Heritage Trail, a series of plaques at various sites engraved with stories relating to New Hampshire’s Black history. This nonprofit performing arts center puts on a full calendar season of concerts, theater, lectures and movies, with a second location just around the corner. Since it was built in 1878, the hall has welcomed everyone from Mark Twain and Buffalo Bill Cody, to John Irving and Tony Bennett. An undergoing capital campaign is revitalizing the venue’s original architectural luster by restoring parts of the venue like the proscenium arch and the Beaux Arts style Founders Lobby. Catch a show or take one of The Music Hall’s monthly public tours. The adjacent Music Hall Loft puts on movie screenings, author talks and a singer/songwriter series in a more contemporary and intimate setting. Since 1976, this brick-laden music venue has been the scene for regular nightly performances. Their schedule includes a Sunday night jazz series, then a Tuesday night game series and a jazz lunch Saturday afternoons. The talent is local, regional or nationally based. Bookings have included the soul/funk group West End Blend, the NOLA-influenced Soggy Po’ Boys and the Seacoast Big Band. The bar has steady patrons who come in for a pint, pub grub and live music. This nonprofit alternative arts organization has set up a cultural hub that’s part performance space, part gallery and part restaurant. The event schedule also presents ongoing film screenings/discussions along with musical performances ranging from Georgian polyphonic songs and chants to a series highlighting regional and local talents. Their restaurant, Block Six, has contemporary farm/sea to table dishes, which could include lamb meatballs with a spicy harissa sauce or locally caught fish with carrot, fregula and bagna cauda. Michele is a travel/lifestyle writer who got over her fears and picky eating habits to immerse herself in destinations as far as Fiji, to date. Her work has been featured on Yahoo Travel, ShermansTravel, Budget Travel, and Epicure & Culture.